One of the most popular luxury shaving kits on the market is the Van Der Hagen Shave Set. 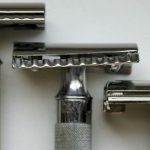 The product we’ll be concerned with in this review is the Van Der Hagen Shave Set. This Van Der Hagen shave set review will look at both the positives and negatives of this popular shaving kit. 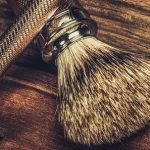 Headquartered in the great state of Texas, Van Der Hagen is well known for producing some of the finest lathers, brushes, and razors for the most affordable prices. 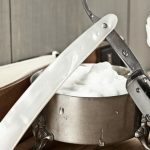 By the end of reading this Van Der Hagen Shave Set review, you should be able to decide whether or not you think this set is a good buy for your grooming needs. 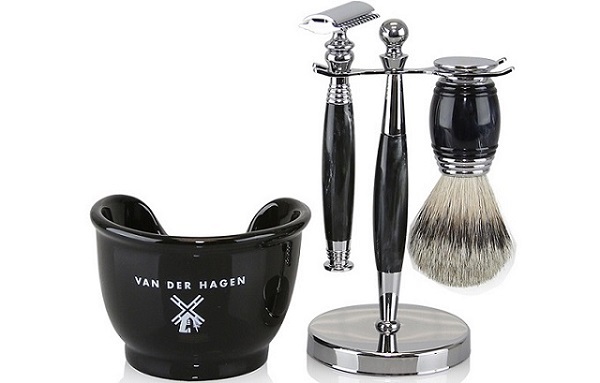 *You can purchase this Van Der Hagen shaving set on Amazon, for the price of $14.29. We’ll start our Van Der Hagen Shave Set review going over the four main items you’ll get in this kit. 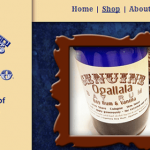 First off, everyone who purchases a Van Der Hagen Shave Set gets a black apothecary mug. Inside the mug, you’ll find a 3.5-ounce hypoallergenic soap bar that has various tropical scents. There’s also a badger brush with an acrylic handle and a clear plastic stand inside the box. You can put the brush handle on the stand to let it dry after use. Just be sure to put a towel or napkin underneath the stand to catch drops from your brush. While you could put any shaver in the razor stand, Van Der Hagen obviously recommends using its own brand. All of these products are made in China and are packaged in a very sleek orange and black box. The Van Der Hagen Shave Set is a perfect kit for beginners getting into luxury shaving. You have everything you need to help you start grooming like a pro except the actual Van der Hagen razor. Also, all of the products included in the Van Der Hagen Shave Set are high quality for the price. For only $14.30, the Van Der Hagen Shave Set is a real bargain for beginners. This product’s overall design is high quality considering you’re only paying around $15. The orange and black box is aesthetically pleasing and all of the products inside are extremely durable. There are very few complaints from online customers about the style of this Van Der Hagen product. Even people without any experience shaving can easily figure out what to do by following the directions on the back of the box. Van Der Hagen lays out exactly what you have to do in four clear and concise steps. Just put the soap into the mug, add a bit of warm water onto your brush, and then move your brush around the mug till you get all the lather you need. It’s really that simple! Most people who write a Van Der Hagen Shave Set review love the smell of the soap. Indeed, many people love the scent so much that they just leave the lather bowl on the sink countertop! A few of the key ingredients in this soap include shea, mango, cocoa butter, and glycerin. Also, this bar of soap was not tested on any animals, so PETA supporters should have no problem using this product. A common complaint in a Van Der Hagen Shave Set review is that the mug isn’t wide enough to easily accommodate the brush. Also, some customers say that the apothecary mug isn’t sturdy enough and is difficult to hold. While there is a knob on this black mug, you really can’t rely on just holding the knob with one hand. 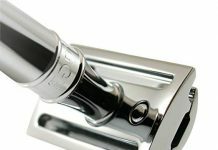 The knob will only offer extra support if you wrap your fingers around it and cup your palm underneath the mug. 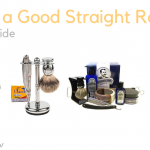 You might find a Van Der Hagen Shave Set review online complaining about the razor stand. Believe it or not, this razor stand isn’t ideal for holding an actual razor. Men find that the actual razor blade is a bit too heavy for the stand to balance. Most people, however, have no problem with the stand holding their brush. A few people who take the time to write a Van Der Hagen Shave Set review say the bristles on the brush fall off too easily. Also, a minority of reviewers don’t like the smell of the badger brush. Remember, this brush is 100 percent badger skin, so you probably won’t like using this brush if you don’t like that particular scent. While these aren’t common complaints, they are a few things to take into consideration. As noted in the positives of this Van Der Hagen Shave Set review, this set is aimed at beginners. 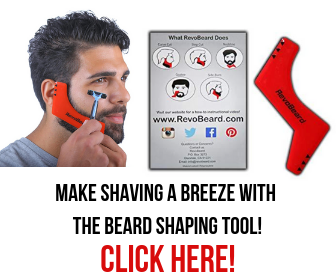 If you’re an intermediate or advanced groomer, you might want to consider using a different razor set. 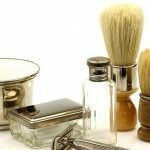 Is Van Der Hagen Shave Set Worth Buying? 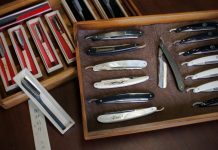 The Van Der Hagen Shave Set is one of the best kits on the market for beginners. While there are a few minor flaws with a few of the products, they aren’t major enough to dissuade you from buying it. Always remember that it’ll only cost you $14.30 for these four items. 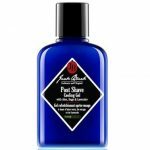 Once you’ve mastered the basics of grooming with these products, you’ll be in a good position to upgrade your shave kit if you feel like you can handle a greater challenge. However, the Van Der Hagen Shave Set should serve newbies and even intermediate shavers extremely well considering its low price and high quality. 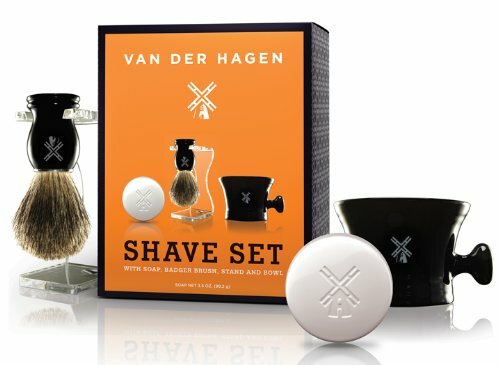 The Van Der Hagen Shave Set is considered a luxury product in the online grooming market. 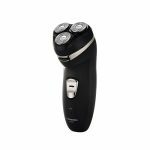 It’s one of the best-selling shave sets, mainly because it’s cheap and gets the job done. As mentioned above, this kit is ideal for beginners. You’ll get a great feel for using a professional badger brush as well as a well-designed lather mug. Nobody has problems with the scent of the soap, and while the stand may not be the sturdiest on the market, it works fine so long as you don’t abuse it. All in all, the Van Der Hagen Shave Set is a great option for people looking for a reliable shave at a cheap price. 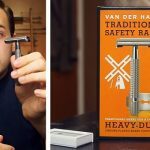 Van Der Hagen Razor Review – Is This Safety Razor Worth Buying? 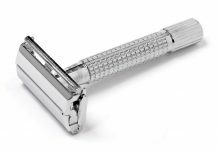 Next articleVan Der Hagen Razor Review – Is This Safety Razor Worth Buying?